Updated Wednesday March 20, 2019 by Brookwood Athletic Association Baseball & Softball. A maximum of twelve (12) players can play defense with a maximum of seven (7) on the infield dirt prior to the ball being hit. Pitcher players in this age group must wear a face mask and heart (chest) guard. B. There will be a 16-foot diameter pitcher’s circle drawn on the infield. The center of the circle will be a point 35 feet from home plate on a direct line between home and second base. C. The pitching mark will be placed 25 feet from home plate on a direct line between home plate and second base. The pitcher may pitch from the 25’ mark or from anywhere behind that point but within the pitching circle. D. A semicircular foul line will be drawn 10 feet from home plate between the first and third base foul lines. Each batter will receive 3 pitches from her adult coach. An additional offensive coach will be permitted behind home plate to catch the pitched balls and return them to the pitching coach. If the batter fails to hit the ball into fair territory on any of these 3 pitches, she will be allowed to hit from a tee. The player will be allowed 2 swinging attempts from the tee to hit the ball into fair territory. If the batter fails to hit a ball fairly in any of these attempts, she will be declared out. Any motion towards the ball on the tee with the bat will be considered a swing. After spring break teams will designate 50% of their batting lineup to hit from coach pitch only. When the team has an odd number of players they must round up to the next whole number. (For example: 11 girls in the lineup, 6 will need to be coach pitch only. 10 girls in the lineup will be 5 girls coach pitch only). Designating 50% of the batting lineup to hit from coach pitch only will not begin until play resumes following spring break. Teams will not have to declare pitch only batters during the fall season. If the ball stops inside the 10-foot area in front of home plate, it is a foul ball. If the ball is touched by a defensive player inside the 10-foot area, whether moving or not, it is foul. If the ball is hit, the coach who is pitching must immediately exit the playing field so as not to interfere with the defense and the umpire’s line of sight. If the batted ball hits the pitching coach, the ball is dead and the batter must bat again without receiving penalty for a swing. If the batter is hitting from the tee, an offensive coach will adjust the tee for the batter, then move to the fence or backstop behind home plate. When the ball is hit off the tee, the coach will immediately remove the tee and bat. If the tee is not removed, any runner crossing home plate will be called out. During spring season, coaches will not be allowed to place the batter or tee in such a manner that will dictate the direction of the batted ball. During fall instructional season, coaches may help players address the ball either verbally or using the “toe-to-toe” approach. If the base runner is past the halfway mark between the bases when time is called, the base runner will be awarded the next base. If the base runner is not past the halfway mark, she must return to the base last touched. There are no bases on balls in this age division. The defensive player pitcher may stand anywhere within or directly behind the sixteen (16) foot pitching circle. Directly behind is defined as if there were two parallel lines running from the outside of the pitching circle and continuing toward the outfield. The player pitcher can stand anywhere between these two imaginary lines behind the pitching circle but no deeper than the edge of the outfield grass. She is the only player allowed in the circle prior to the ball being pitched. No more than seven (7) defensive players will be allowed on the infield prior to the ball being hit. No defensive player may stand closer to the batter than the player pitcher. Two (2) defensive coaches will be allowed in the outfield at all times. They cannot touch the ball or enter the infield playing area. If a coach touches or is struck by a ball, or enters the infield, the base runners will be awarded an additional base after play has been stopped. When a ball is in play, the umpire will call time out when either a) the player pitcher has full control of the ball and is inside the pitcher’s circle with both feet; Or b) when in the judgment of the umpire, all runners have stopped advancing. If the player pitcher is attempting to make a play and runs through the circle, the umpire will not call time. If a player hits a fly ball to the player pitcher and she catches it, it will be the umpire’s judgment whether to call time. Any time players remain in jeopardy of being put out, umpires have the option to not call time. If the batter hits a ground ball that is fielded by the player pitcher inside the circle and she makes no attempt to make a play at first, the batter will advance to first base however, no other runners may advance unless forced. A batted ball fielded by the player pitcher in or around the circle must be thrown to first base to record an out. The player pitcher must make and overhand attempt to throw the ball (unless the proximity to first base after fielding the ball would suggest that an underhanded toss would be appropriate) and may not intentionally roll or ground the ball to the first baseman. The player pitcher may not run the batter down and apply a tag UNLESS in the umpire's judgment, that would have been the appropriate play at the more advanced levels of girls’ softball. 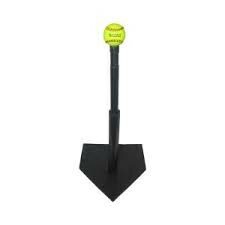 Example 1: If a batted ball is fielded by the pitcher player in or near the base line, she may elect to tag the batter. Example 2: If the player pitcher fields a batted ball that was hit in the direction of first base and the first baseman also made an attempt to field the ball and is not covering the base, the pitcher may proceed to tag the runner or step on first base. The key to this rule is….was the action of the player pitcher comparable to what you would expect at higher levels of play. This rule applies only to plays made at first base. The player pitcher may run and tag any runner advancing to other bases.